Welcome to the LakesNeedWater newsletter May 2010 "Mothers Day" edition. Since the last newsletter, LakesNeedWater has celebrated its first anniversary. Our web site has had 79,000 hits and attracted 18,000 visits by 7,000 unique visitors. While the winter rains in the Murray Darling Basin catchment are very good news, the situation in the Lower Lakes remains dire. The water volumes coming down the River are not sufficient to restore levels to sea level and flush out the increasingly saline, turbid waters. While Lake Alexandrina's water level has increased 40 cm from it's historic low, it still remains 50 cm below sea level, and 1.25 metres below the old "full supply" level. Lake Albert's water level on the other hand has not been reported by MDBA since March 2010, and Goolwa's water level has dropped 80 cm since last summer. In summary, the situation in the Lower Lakes has not changed much. The plain truth is that the full restoration of the Lower Lakes to a vibrant estuary is the only sustainable long-term solution for the region and we at LakesNeedWater will continue to hammer away until common sense prevails. Thank you for your support and don't forget to spread the word. This last month an interesting 'community event' was held in Goolwa. Professor Mike Geddes gave a talk about his idea for a "Freshwater-driven Estuary for the Lower Lakes and Coorong". Members from LakesNeedWater attended the talk on 22 April, and a summary is available on our website. Interestingly, the media has chosen not to report on this very significant change in direction from one of our local wetland scientists. A company called Nearmap has photographic images of the Lower Lakes that are current as of December 2009. This is significant since the satellite maps we have on the site are old, as far back as 2006. Areas at risk for acid sulphate soil problems can be clearly be seen on these more recent images. Take a look. 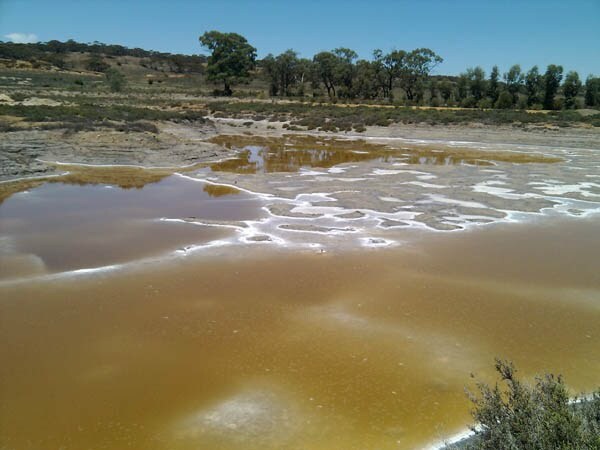 A recent SA government publication identifies that now 18 of the wetlands below Lock One have acid sulphate soils. The wetlands will be inundated with the water coming down from the Qld floods. The process to manage how much acid is released into the river channel and ultimately Lake Alexandrina is outlined in this document. This photo taken in December 2009 below Lock One adjacent to the main River Murray channel.